VIRGIN TRAINS has claimed that HS2 will reduce the level of service for some towns on the classic West Coast Main Line. The Department for Transport has rejected the allegations, saying that the new High Speed line will improve rather than cut capacity. Virgin is concerned about the extra paths which will be needed on the classic network for trains which leave HS2 and continue their journeys further north. This would initially have implications at Stoke and Stafford for trains leaving HS2 just north of Birmingham after the first phase opens in 2026, and later for trains to such places as Carlisle and Glasgow when the full 'Y' shaped network has opened in 2032-33. 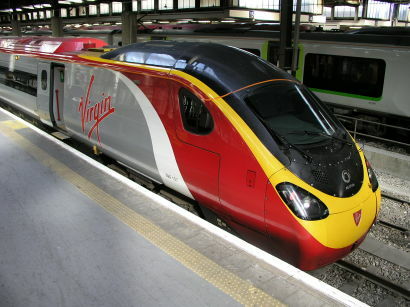 A further issue is that the new 'classic-compatible' trains running at 350km/h or even more on HS2 will, according to Virgin, be limited to just 160km/h on the rest of the network – 40km/h slower than Virgin's current Pendolino fleet. Virgin is reported to have voiced its concerns in a memorandum to transport minister Patrick McLoughlin. The operator claims that one solution would be a new fleet of tilting trains which could run at 217km/h (135mph) on the classic network and up to 360km/h on High Speed infrastructure. Virgin said it did not oppose HS2, but wanted to make sure that there were 'more winners than losers'. However, a DfT spokesman disagreed, saying HS2 would increase capacity and provide a 'step-change in competiveness'. Virgin is currently in talks with the DfT about the proposed extension of its Intercity West Coast contract from November this year to April 2017.